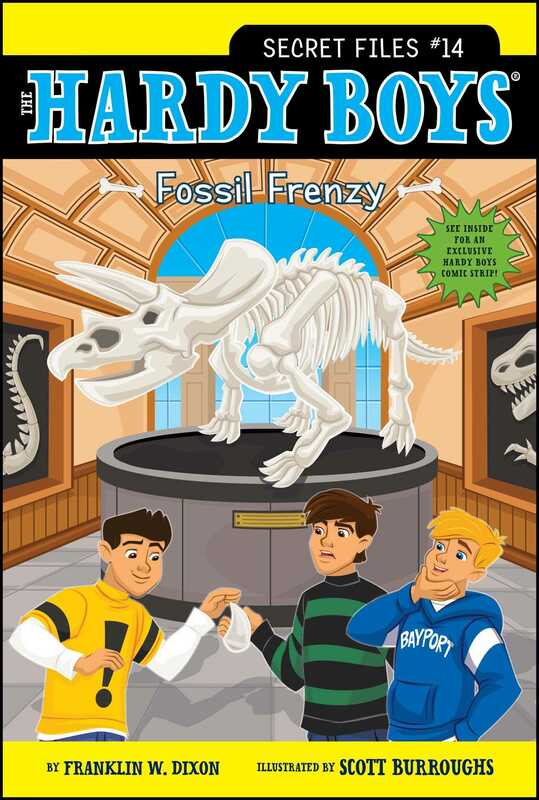 A missing dinosaur tooth makes for a massive investigation in this Hardy Brothers Secret Files Mystery. Frank and Joe are excited for their field trip to the Bayport Museum of Natural History with their science club. Not only will they get to see some awesome dinosaur skeletons on display, but they also get to go on their very own fossil dig on the museum grounds. At the dig, fellow classmate Tico uncovers an old dinosaur tooth—even though Tico’s biggest competition in the club, Aisha, claims she found it first. And when Tico realizes his tooth is missing—a tooth that turns out to be immensely valuable—all signs point to Aisha. But is she really the culprit? It’s up to Frank and Joe to dig deep for the answers in a case that is bigger than they ever imagined! Joe Hardy’s clawlike fingers crept across the kitchen table and grabbed the helpless hot dog. “ Roar!” he growled in his best dinosaur voice. He chomped down on the hot dog with his teeth and tore a piece off. “An ultrasaurus. Can’t you tell?” Joe said. “Ultrasauruses are herbivores, remember? They only eat plants,” Frank pointed out. “Right. T. rex loves meat. Except they didn’t have hot dogs back then,” Frank joked. The two brothers had talked about nothing but dinosaurs all weekend. The next day they were going on a field trip to the Bayport Natural History Museum with their school’s science club. The museum was famous for its huge brachiosaur skeleton, and a bunch of other dinosaur artifacts too. The boys couldn’t wait! Joe and Frank really liked the science club, which was led by science teacher Mr. Wachowski. Their good friends Phil Cohen and Chet Morton were in it. The other members were Tico Sanchez and Aisha Mehta from Frank’s fourth-grade class and Isobel Kaltman from Joe’s third-grade class. The club was pretty new, but they’d already done some cool activities—like growing bacteria in petri dishes and seeing who could turn bananas brown and yucky the fastest. “Omnivores. They eat plants and meat,” Frank said. “Hey, those are my fries!” Frank protested. Joe and Frank groaned. They had almost forgotten about spring cleanup. Leave it to Aunt Gertrude to remind them of something not fun. Still, Aunt Gertrude wasn’t always the Queen of Chores. And she had been a big help to Mr. and Mrs. Hardy since moving in with them. She lived in a big room over the garage that Mr. Hardy had fixed up. “Yes. Did you make up your beds?” Aunt Gertrude asked. “Uh . . .” Joe and Frank exchanged a glance. “Yard work, then make your beds, and then you may go,” Aunt Gertrude said. The brothers nodded and quickly scarfed down the rest of their lunches. When they had finished, they put their plates and cups in the dishwasher and headed outside. The early spring air was cool and smelled like wet leaves. In a shady spot near the driveway, the last mound of snow from winter had almost melted away. Squirrels bounded across the lawn. Laura Hardy was busy raking one of the flower beds. She wiped her brow and smiled at her sons. “You’re just in time. Can you start pulling up weeds and making a pile over there?” She pointed to a spot on the grass. “He had a meeting with Officer Heller,” Mrs. Hardy replied. Fenton Hardy was a private investigator who often worked with the Bayport Police. He used to be a member of the NYPD, a.k.a. the New York Police Department. Like their father, Joe and Frank were detectives. They had solved more than a dozen mysteries in Bayport—everything from finding a missing dog to chasing down zombies. They weren’t in the middle of a case at the moment, though. In fact, things had been unusually quiet in Bayport. “You two must be very excited about your field trip tomorrow,” Mrs. Hardy remarked. “Yeah! Mr. W. said we get to do a dinosaur dig while we’re there,” Joe said eagerly. “And we get to take home whatever we find,” Frank added. Joe and Frank turned. Chet was running down the sidewalk toward the Hardys’ house. “Hey, Chet! We’re supposed to go to your house, remember?” Frank called out. Chet stopped in their front yard. “I just heard some bad news, and I couldn’t wait,” he said, panting for breath.